The ongoing deleveraging of the $500 trillion derivatives markets claimed its biggest scalp on Sunday - Bear Stearns, formerly one of the worlds top investment banks and now taken over by JP Morgan to prevent a global financial panic, with the aid of funding and guarantees from the US Fed amounting to $30 billion which was reminiscent of the UK Governments bailout of Northern Rock Bank. The dominos started to fall against Bear Stearns earlier in the week, as customers withdrew more than $25 billion in just three days. The large financial institutions behaved little different to the panicking Northern Rock customers albeit without the queues as they rushed to withdraw funds before Bear Stearns went bust on the basis of further mortgage related losses. The US Fed cut the Discount rate on Sunday from 3.5% to 3.25% in an attempt to provide liquidity to other US banks on Monday should there be further panic withdrawals. This implies that the Fed Funds Interest rate cut this week could be as much as 1%, i.e. taking US interests down to 2% from 3%. So how much did JP Morgan pay for one of the worlds biggest investment banks ? Just $2 per share or $370 million ! A far cry from the $160 per share the bank was trading at just a few months ago, and just 3% of the $62 price the bank was trading at just last Thursday. The bank is now dead in its former role, whatever emerges will be a mere pigmy of its former self, much as is expected of Northern Rock Bank. 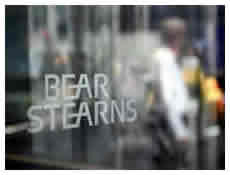 The credit crisis for Bear Stearns comes full circle as it came to public attention back in July 07 when Bear Stearns had to bailout two of its own hedge funds at a cost of $3.2billion. The credit crunch of 2007 has become the credit crisis of 2008. The bank failure illustrates that the end is nowhere insight. This crisis is going to roll and grow all the way into 2009 as the downward spiral will result in further economic contraction due to the fact that for every $1 billion of losses results in an estimated $10 billion reduction in credit made available to main street borrowers. Therefore the growing estimates of losses that could reach as high as $2 trillion could prove highly deflationary. The first shoots of an end to the credit crisis will only be found in the stabalisation of the US housing market, until then watch for many, many more banks to follow both Northern Rock and now Bear Stearns into financial oblivion. For the latest on the Credit Crisis subscribe to our free weekly newsletter.